"See Your World Through Our Eyes"
If You Have a Question About Your Eyes, Click on a Topic Below. The following frequently asked questions (FAQs) are excerpted from the book "Lessons from the Practice-The Gift of Sight" written by Robert M. Kershner, M.D., F.A.C.S. Copyright 1994-2003. All Rights Reserved. Not to be reproduced by any means, mechanical or electronic without the written permission of the author. Glasses, Contacts - Where'd They Go? So What's All This Talk About Laser Vision Correction? When Should You Get Yours Eyes Examined? Why Do We Require Reading Glasses After We Turn Forty? Will Wearing Eyeglasses Make My Eyes Dependent Upon Them? Do Wearing Contacts Slow Down the Deterioration in My Vision? If I Need to Keep Changing Eyeglasses are My Eyes Getting Worse? What is Amblyopia or "Lazy Eye"? When Should a Child's Eyes Be Examined? If My Child's Eyes Are Crossed, Will He Grow Out of It?? If I Need to Wear Eyeglasses Will My Child Need Them Too? Do Eye Exercises Really Help? What About Pinhole Eyeglasses, Do They Improve Your Vision? What About Those Lenses that Block Out Blue-Light? 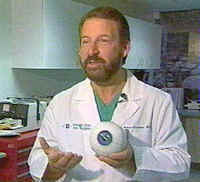 Can Ophthalmologists Transplant an Eye? Why Am I Dependent Upon Eyeglasses? What is Myopia or Nearsightedness? How Can I Reduce or Eliminate My Need for Glasses and Contacts? What Can I Expect After Laser Vision Correction? How Can I Find Out If I Am A Good Candidate? What is a Pterygium or Pinguecula? How Can I Tell If I Have Dry Eye? How Does Dr. Kershner Aim the Laser? Will The Laser Treatment be Painful? What Will I Experience During the Laser Treatment? What If I Move My Eyes or Close My Eyelids? Will My Vision be Blurred Following the Laser Treatment? Do I Take My Regular Medications on the Day of the Laser Treatment? Where Will The Laser Procedure Take Place? It isn't every day that a doctor gets a taste of his own medicine, but after years of enjoying the satisfaction of giving my patients clear vision following eye surgery and relishing in their ability to see clearly without dependence on eyeglasses or contacts for every task, I decided to become a patient myself. I have worn glasses for the better part of four decades. Contacts never worked well for me, they were difficult to insert, uncomfortable to wear and I never saw clearly. So just like many ophthalmologists, I wore glasses. As an eye surgeon, the dream of one day freeing myself from this handicap is one that I shared with thousands of others. So why choose surgery? With today's advanced technology, the surgical reshaping of the eye's cornea with LASIK Excimer Laser procedure can bring images into more natural focus, replacing the need for eyeglasses or contact lenses. Let me tell you about my experience. I've have never enjoyed wearing glasses, the simplest of activities like reading the alarm clock or turning on the lightswitch was not possible without them. I spent much of my day cleaning my glasses to ensure the clear vision that I required as an ophthalmologist. And swimming, skiing, playing tennis, or driving was impossible without them. But like many others, I put up with what I considered a necessary handicap. So, after experiencing the delight of thousands of my own patients on whom I had performed refractive correction to provide lens-free living, several years ago I decided it was time to have my own eyes corrected. The whole thing took a matter of minutes, with no shots, no stitches, no bandages and no pain! And the result is amazingly clear. Having had my vision corrected, rather than depending upon eyeglasses and contacts for the rest of my life, is one of the best things I've ever done for myself. I cannot explain the excitement of awakening to clear images. Taking a shower, walking in the rain, and travelling has taken on a whole new dimension. It is a sheer pleasure to play sports, swim and actually see underwater, bike, play tennis and ski without glasses getting in the way. And best of all, I can now work all day without constantly cleaning my glasses. Even though my experience is similar to that of many of my own patients, this procedure is a matter of individual life-style choice, and it may not be for everyone. I know that if I had to do it all over again, I would do it again in a heartbeat, and my only regret was not having had it done sooner. Because of my intensely positive personal experience with this delicate and wondrous procedure of vision correction, I today can share my experience with those of so many others. I, too, am a believe,r and I know that many other doctors, nurses, athletes, police officers, firemen, lawyers, soldiers, technicians, housewives, models, line workers, miners, construction workers, actresses, actors, bank tellers, students, service personnel, flight attendants, politicians, secretaries, accountants, transcriptionists, clerks, and the thousands of others who have delighted in this technology are believers, too. Ask your optometrist or ophthalmologist about the options available for you. Clear vision is in sight...the new vision correction procedures of laser PRK, LASIK and the Implantable Contact Lens may be the right choice for the new you. The desire to be able to see without depending upon an optical device has been one of mankind’s goals for centuries. The discovery of modern day refractive surgery, the procedures which ophthalmologists perform to permanently correct the eye’s incorrect focus, had a most interesting beginning. It all started in Moscow, Russia in 1973. A thirteen-year-old boy by the name of Boris Petrov was involved in a fight in the school yard. During the fight, his eyeglasses were broken and pieces of the glass cut the cornea or clear surface of his eye. The boy was taken to the Moscow Eye Institute where he was attended to by world famous eye surgeon Svyatoslav N. Fyodorov. Dr. Fyodorov cleansed the eye and bandaged it tightly for several days. When the bandages were removed, the boy remarked to Dr. Fyodorov on how much more clearly he could see without his glasses than he could before the injury. Dr. Fyodorov examined the child’s eye and discovered that the tiny cuts made by the shards of glass had reshaped the cornea and corrected the child’s focus. Dr. Fyodorov felt that if a thirteen-year-old boy could correct his nearsightedness with broken pieces of glass, then Dr. Fyodorov as an experienced eye surgeon could do the same for others with delicate instruments in a careful planned fashion. This became the beginning of what is known as the refractive surgical procedures to correct nearsightedness, farsightedness and astigmatism, the early procedures of radial keratotomy. In 1978, a small group of pioneering ophthalmic surgeons from the United States traveled to the former USSR and studied with Dr. Fyodorov to learn his remarkable techniques. They brought the procedure back to this county. A national study commenced known as the Prospective Evaluation of Radial Keratotomy. This study demonstrated that despite rudimentary techniques and instrumentation at the time, doctors were able to surgically correct eyes with imperfect focus with a safe, reproducible and effective procedure. Since that time multiple refinements in technique and instrumentation have occurred. Further development of ultra-sonic measuring devices, computer assisted corneal mapping and computerized nomograms precisely measure the cornea and tell the surgeon how and where to place the correcting microincisions within the accuracy of one micron, or one-one thousandth of a millimeter. This made radial keratotomy the most delicate microsurgical procedure in use for many years. Several other techniques were subsequently developed to reshape the cornea and correct the eye's imperfect focus. For people who are farsighted or extremely nearsighted, the automated corneal shaper was utilized to perform lamellar keratoplasty (ALK) to reshape the central cornea. In 1995, the United States Food and Drug Administration approved an investigational device known as the excimer laser. This microscopic laser removes incredibly small amounts of corneal tissue with an ultraviolet laser, and instead of making radial incisions, can correct nearsightedness, farsightedness and astigmatism. Today, the Excimer Laser and the procedure known as LASIK are increasingly being utilized to accurately perform one of mankind’s longtime goals and the ophthalmologist’s finest microsurgical miracle procedure, to correct the focus of the human eye. Cataract surgery is one of the oldest known surgical procedures. Writings concerning the treatment of cataracts date back to the Bible, ancient Egyptian papyruses and the writing of Hippocrates. Surprisingly, the actual procedure had changed very little over thousands of years. Cataracts were once believed to be a film or growth in the eye. The treatment for correction of this growth was to get the obstruction out of the way. This procedure was known as couching. The surgeon, who could be anyone from the local medicine man to the barber would insert a sharp object into the eye and push the clouded lens out of the way. Many famous people throughout history underwent this procedure including the artists Michelangelo, Rembrandt and Renoir. Fortunately, in the twentieth century modern surgical techniques began to change the nature of cataract surgery. It became a major surgical procedure requiring general anesthesia and a hospital stay. A large incision was placed into the eye with the patient asleep, the cataract surgically removed from the eye, the eye stitched closed and heavily bandaged. Patients were kept at bed rest with their heads sandbagged into position to prevent movement for days at a time. Then when the eye was healed, a very thick pair of eyeglasses were fitted to allow the patient to see once again. The glasses were cumbersome and caused excessive magnification and distortion. Still it was better than going blind from cataracts. This procedure was utilized until the early 1980s. In 1949, a physician in the British Royal College of Surgeons, Mr. Harold Ridley, was experimenting with the correction of aphakia (the loss of the human lens from cataract surgery) by implanting artificial lenses into animals. As World War II broke out, he treated many fighter pilots whose eyes were injured by shattering plastic from the windshields of their fighter jets damaged during air combat. He discovered that if the tiny pieces of plastic were left in the eye, they were very well tolerated. A medical student suggested to Dr. Ridley that he use this plastic known by the chemical name, polymethylmethacrylate or Perspex CQ, as the material for a human intraocular lens implant. Thus became the beginnings of the artificial lens implant to replace the cataractous lens removed at the time of cataract surgery. Intraocular lens implants or IOLs gained in popularity in this country in the late seventies and early 1980s and is one of the most important advances in the field of modern eye surgery. In fact, Robert Young, the actor who played Dr. Marcus Welby in the TV series, credited the procedure with saving his career. Recent advances in the techniques of cataract surgery continue to make this one of the fastest evolving surgical procedures known in medicine. Today cataracts are removed using a process known as phacoemulsification. A tiny hollow titanium needle is introduced through an incision of about one millimeter and the entire cataract is liquefied and vacuumed out through the tube in a matter of minutes. Because the incision size is so much smaller than conventional surgery, hospitalization, general anesthesia, sutures and bandages have all been eliminated. Someday we may understand why cataracts develop and prevent them from occurring. Until then, todays' advanced technology can make the daily modern miracle of cataract surgery a reality of clear vision for millions the world over. It was nearing the end of a long, hot dusty day in the Navajo reservation in northeastern Arizona when a young man stood shyly in the doorway of our makeshift eye clinic just as we were about to close our doors for the night. The young man explained that his great-grandmother wanted her eyes examined although she had never been to a doctor in her life. As a volunteer at the Arizona Medical Eye Unit, a project started in 1979 to provide ophthalmic examinations to the Indians of the Navajo reservation, I was aware that many Indians did not receive specialist medical care if they did not travel off the reservation. He explained that she lived as many Navajo elderly did, with her family in a "hogan" or hut. For the past 27 years he had known her, they had cared for her, clothed her, and fed her because she was blind. He walked to his truck and returned leading an elderly woman by the arm. For me, in 1985, a young doctor from the city, she was a magnificent sight. Dressed in the traditional long black dress of the Navajo, she was wearing elaborate pieces of turquoise and silver jewelry, collected through years of trading between various Indian groups of the region. One look in her eyes revealed that both of her pupils were as opaque as the turquoise jewelry that she wore. She had advanced cataracts. I told her great-grandson that her sight might be restored by surgery, which could be done in Tucson, several hundred miles to the south. A preoperative physical examination showed this 103 year old woman to be in remarkably good health. With local anesthesia and with her great-grandson interpreting my instructions for her, a cataract was removed and an intraocular lens implanted. The next morning, as the bandage was carefully removed, she looked at me and spoke a few pleasant-sounding words in Navajo. Her great-grandson translated that she "liked my beard." Hearing his voice, she turned to her great-grandson and smiled. She knew who he was from the sound of his voice, but she had never before seen his face. That evening, on my drive home, I took the long way through the foothills surrounding the city. As the sunlight reflected its colors on the mountains, I imagined seeing it all for the first time. Question: There have been so many advances in surgery that corrects vision...it is all very confusing. What is this new surgery called LASIK? How is it different from PRK and RK? Vision correction procedures comprise the most exciting advance in the rapidly changing field of ophthalmology and microsurgery of the eye. From the earliest procedures to correct nearsightedness and astigmatism, radial keratotomy, developed by Dr. Svyatoslav N. Fyodorov from Moscow, Russia in the early 1970s, to the most recent advancements in laser reshaping of the eye, LASIK, we have come a long way from the dependence upon eyeglasses and contacts to clear vision without lenses! The eye works by bringing light through the outside window of the eye - the cornea - through the pupil and the lens, until it focuses on the retina. If the curvature of the cornea is steeper than normal, or if the eye is slightly elongated, light is improperly focused and nearsightedness or myopia occurs. In this case, only objects up close are in focus and everything else is blurred. An irregularity to the corneal curvature is known as astigmatism, which is one other distortion of vision. Radial keratotomy, previously the most commonly performed and best known of the refractive procedures, flattens the surface of the cornea, the clear part of the eye through which we see, with microscopic incisions around the center of vision. Thousands have undergone this procedure, which has quick recovery and corrects both nearsightedness and astigmatism. In 1976, researchers at IBM developed a laser technology known as excimer for use in industrial applications to create computer microchips. This particular type of laser can produce very precise etching of material with almost negligible effects outside the area which is targeted. In June of 1983, Stephen L. Trokel, M.D. of New York worked with physicists at the IBM Research Center in Yorktown Heights, New York, and demonstrated that excimer laser radiation could be utilized to reshape corneal tissue without damaging it. This is the basis of the patent which Dr. Trokel received in 1983. Since that time, several other ophthalmic surgeons have applied the excimer laser clinically to correct astigmatism and nearsightedness (myopia), and farsightedness (hyperopia). In the United States two companies - Summit Technology of Waltham, Massachusetts and VISX of Santa Clara, California - successfully collected data from surgeons utilizing this technology to be awarded approval by the United States Food and Drug Administration for use in the correction of human vision in 1995 and 1996. Early work with the computer-controlled laser showed that precise microscopic amounts of corneal tissue could be removed, thus flattening it and potentially bringing the eye into more normal focus. This procedure is known as photorefractive keratectomy or PRK. Despite promising initial results, acceptance by the general public was slow. In an effort to improve the precision and speed up the healing following the laser procedure, pioneering refractive surgeons applied different techniques to the application of the laser. LASIK is one such technique. The name LASIK is short for laser in-situ keratomileusis. Like photorefractive keratectomy with the excimer laser, LASIK reshapes the cornea. Using an automated instrument known as a microkeratome, the refractive surgeon creates a flap on the surface of the cornea. This flap remains attached on one side and, as it is folded over, the excimer laser is applied to reshape this newly exposed layer of cornea. Once the surface of the cornea has been reduced by the exact amount determined by the computer, the surgeon returns the flap of surface cornea to its original position and the procedure is completed. Usually the excimer laser procedure takes less than one minute to perform. Following the procedure, the eye has been reshaped by the appropriate amount and images can now come into more natural focus. Many surgeons feel that LASIK offers advantages over PRK and RK by leaving the surface tissue of the cornea undisturbed. Recovery is quicker and any discomfort is reduced. The likelihood of a successful outcome following modern laser surgery is excellent. As with all surgical procedures however, there are certain risks. Unsatisfactory results with the laser are uncommon, though there is a small likelihood that the microkeratome cannot create a proper flap and the procedure has to be delayed. To learn more about the vision correction procedures or to find out if you are a candidate, consult an ophthalmologist or optometrist, who has experience with these new techniques. The promise of natural vision, once a dream, today can become a reality. These (FAQs) are excerpted from the book "Lessons from the Practice-The Gift of Sight" written by Robert M. Kershner, M.D., F.A.C.S. Copyright 2000. All Rights Reserved. Not to be copied by any means, mechanical or electronic without the written permission of the author.